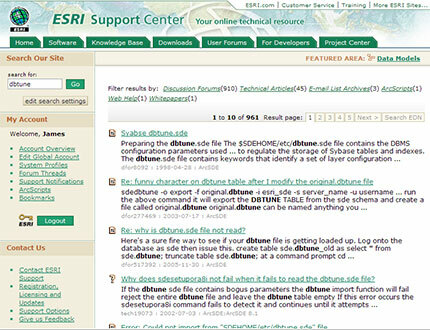 It appears that ESRI has rolled out a new search tool for their support site. The new search also has a link at the top to perform the same search in EDN. One nice feature is that you can customize your search settings by product (ArcCad, ArcView 3.x, ArcWeb, etc), areas (ArcScripts, Data Models, E-mail List, etc) and display (results/page, date created). This really simplifies the search process right from the front page of the support site, rather than having to go into the advanced search. EDN’s search has been similarly upgraded as well. We’ll have to see if the results have been improved as well, but the interface is much easier to work with.